KOJIRO UMEZAKI is a performer of the shakuhachi, a composer of electro-acoustic works, and a specialist in developing music-technology systems for live performance. 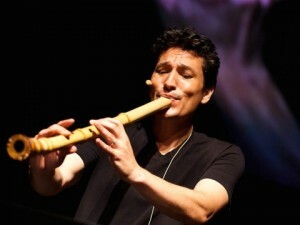 He performs regularly with the Silk Road Ensemble. Notable recordings include Brooklyn Rider’s Dominant Curve (In A Circle, 2010); The Silk Road Ensemble’s Beyond the Horizon (Sony BMG, 2005), New Impossibilities (Sony BMG, 2007), and Off the Map (World Village, 2009); Yo-Yo Ma’s Appassionato (Sony BMG, 2007) and Songs of Joy and Peace (Sony BMG, 2008); Beat in Fractions’ Beat Infraction (Healthy Boys, 2007); and The Silk Road: A Musical Caravan (Smithsonian Folkways, 2002).